In my yoga teacher training, I followed my heart and had a break from creating websites, this was because the maintenance of the sites took over my world and it became too stressful waking up to another cyber attack, I wasn’t making enough money to carry on with this side of my business and it was effecting my health. So I decided to hand over the original sites to their owners and the new sites I create will be given to the business owner or a maintenance person of their choice. Being a yogi of 18 years, my lovely husband paid for a yoga level one teacher training course for my fiftieth birthday, oh my goodness, what a journey, I am not even half way through and trying to love myself has been the hardest thing to strive for. I am now on module 6 out of 14 and have 3 out of 5 assignments started, the course has no deadline to finish but I have set a two year deadline for myself. I’m glad I’m doing the course now at my age as I am far more humble, and treat the wonderful ancient health system with the respect it deserves. I was going to do my teacher training nine years ago but my ego was leading me back then and I hurt my back trying too hard to do a difficult asana. I couldn’t practice ashtanga yoga for a while and had to walk, I walked and walked and walked, on a walk there was a cruel site, a beautiful yogi saluting the sun on the water front where I live, I haven’t seen anyone do that before or after my injury. I will get to the point I am trying to make about mindfulness and creativity. I am more mindful these days because of yoga, my creative brain is screaming out for more projejcts, I have decided to put my cartooning and illustration skills to the test and write and illustrate my own children’s book, the book will be based around my characterful dog Duchess, she is an Australian cattle dog, red healer, very pretty and pretty annoying in a puppy, happy way. She is always happy! Even when we are angry because she ate the dinner which was thawing in the kitchen, even when we are revolted by her eating habits she has a beautiful smile on her face and a constantly wagging tale. 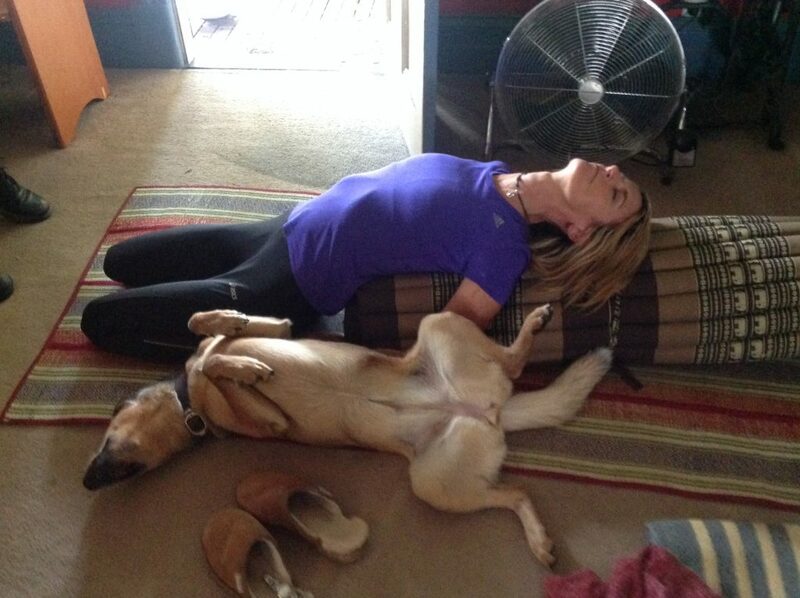 As you can see from the picture, she also likes to practice a bit of yoga, very calming for her temperament and mine. So to cut a long story short, the brain is an amazing thing and it can be helped through mindfulness to work at its full potential. Being the witness of you’re thoughts gives you the control over them and not the other way around. You start to see things you may have looked at every day but not stopped to actually see it, seeing beauty in ordinary life brings a sense of deep peace and contentment, from this environment, creativity flourishes and flows naturally. Thank you for reading my blog, I will keep you posted on the progress of the book and my teacher training as I go along this wonderful creatively mindful journey.